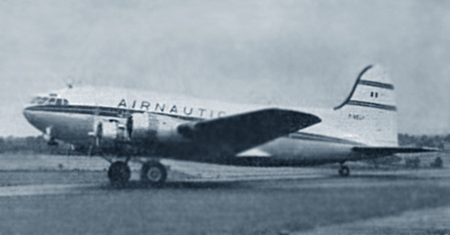 F-BHRQ Sud Aviation SE.210 Caravelle III (46) "Limousin". 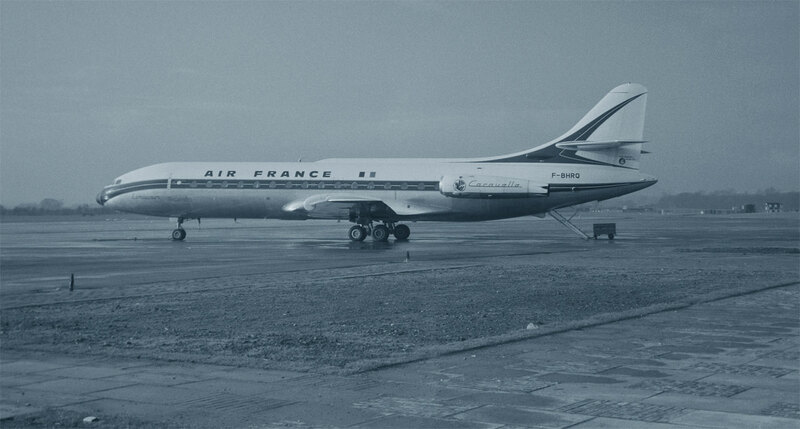 It took eight and nine years before I managed to fly on four of these fine aircraft, they were F-BJTS (27) "AF683" from Zurich to Paris-Orly; HB-ICU (123) "SR574" from Zurich to Stuttgart ; I-DABP (192) "AL424" from Naples to Rome, and SE-DAA (4) "SK531" from Glasgow to Copenhagen. 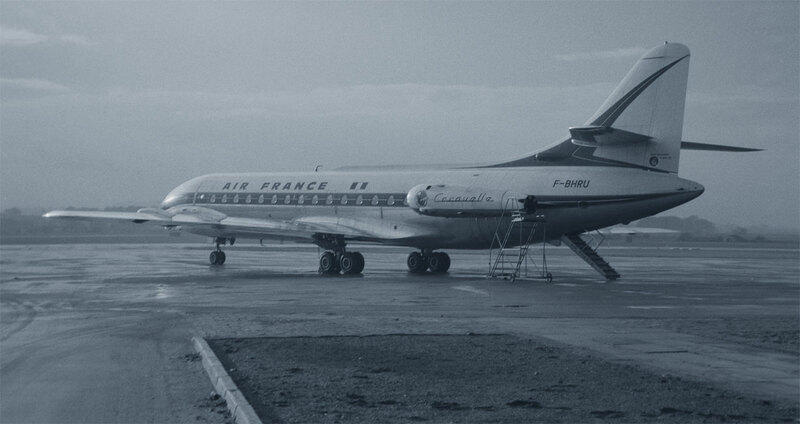 I asked if I could see "inside", and was granted a grand tour of F-BHRU Sud Aviation SE.210 Caravelle III (58) "Poitou" Air France. This airframe was broken up at Orly in December 1980. 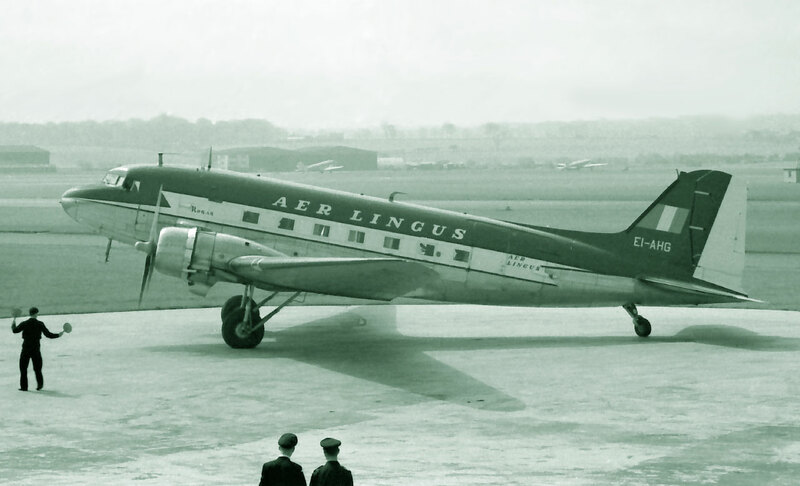 The Carvelle was a very beautiful looking aircraft, and the soft triangle/delta shaped windows served as inspiration for many of my jewellery creations in later years! TS423 Douglas Dakota III (19347) RAF operated by Ferranti Flying Unit. A very distinctive nose, and a familar sight in Scottish skies for many years. Ex 42-100884 to, G-DAKS, and N147DC. Plane spotting sometimes was a pretty miserable occupation, like the Marshaller, I endured a soaking to capture the arrival of OO-TMA Piper PA-23 Apache. Visiting XR801 (89) an ETPS Vickers V.744 Viscount was parked over at the Ferranti Hangars. The Empire Test Pilots School was based at Farnborough, Hampshire, England.